As per Fullintel’s comprehensive media impact report, Google had the maximum coverage at the 2018 Consumer Electronics Show. "Fullintel’s analysts spend an enormous amount of time on grunt work to provide the most appropriate and contextual media intelligence possible"
Leading business intelligence and media monitoring firm, Fullintel has released a media impact report for the 2018 Consumer Electronics Show. The world’s largest annual consumer technology trade show, CES kicked off in Las Vegas on January 9th, 2018. This year, over 4,500 exhibitors from around the globe displayed their innovative products to more than 170,000 attendees. Fullintel’s media analysts have combed more than 30,000 stories from both traditional and social media to study the complete media impact of the show. “Fullintel’s analysts spend an enormous amount of time on grunt work to provide the most appropriate and contextual media intelligence possible,” added Andrew Koeck, Co-founder and President of Fullintel. The analysis involved studying more than 700 million impressions on Twitter and online to ensure 360 degree coverage. 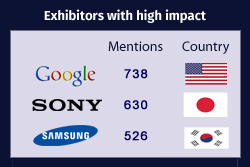 The report highlights the comparison of mentions received by top exhibitors by region and outlet. The analysis also displays the top journalists who covered the CES and the impact that was registered across social media. Using an infographic design, the report analyzes key messages, major activities, prominence, media value, share of voice, sentiment and many more relevant metrics. A copy of the report can be downloaded from this link.